Home » Public Relations » News » Photography Exhibition "Through Kinshasa"
In the Small Gallery of the SAF Central military club the exhibition of Lieutenant Colonel Sasa Mickovic "Through Kinshasa" was opened. A surgeon by profession, Mickovic took those photographs in the capital of the Democratic Republic of the Congo where he spent more than half a year as the SAF member staff in the UN medical mission in that country. 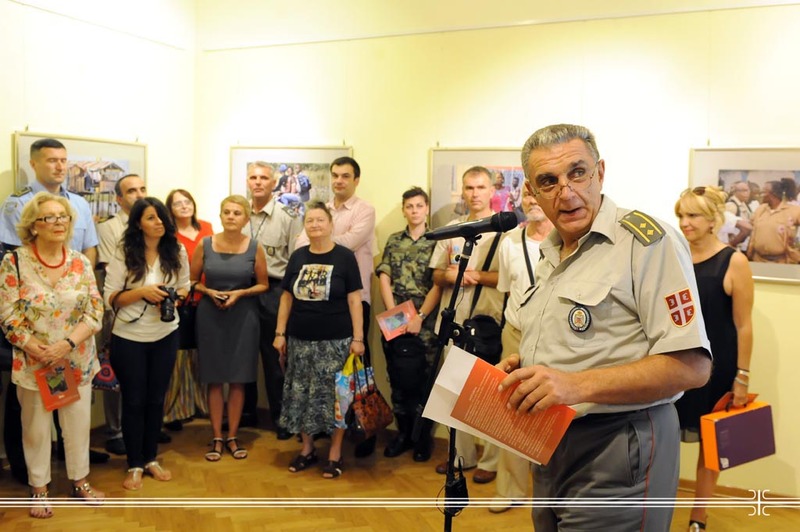 Opening the exhibition, Head of the Centre for Peacekeeping Operations of the GS SAF Colonel Milivoje Pajovic stressed that Colonel Mickovic, staying on two occasions as a peacekeeper on the African continent, taking photographs succeeded in recognizing and setting aside with his surgical precision the local everyday life. According to Deputy Director of the Media Center "Odbrana" Lieutenant Colonel Zoran Krupeza, the exhibition showed that the author managed the impossible - he took all visitors of the gallery, at least for a moment, to Kinshasa, and also brought the spirit of Kinshasa to Belgrade. Referring to the circumstances in which the photographs taken, Lieutenant Colonel Sasa Mickovic, author of the exhibition, said that as a chief crew member for medical evacuation by air was able to have daily encounters with the rich colors of Kinshasa, and also with the hard life of people in the African country. He also pointed out that this is his second exhibition of photographs, and the first was at the National Museum in Vranje. The motives of everyday life, which are the focus of this exhibition, testify to the lives of people on the street, the market, on the river, in a fishing village, depicting the culture and pulsing of life in a distant city on the African continent. All interested can tour the exhibition "Through Kinshasa" till 9 September 2016, from 11 a.m. to 7 p.m.
News Photography Exhibition "Through Kinshasa"